Bike through the biggest and oldest urban park of Mexico City at a soft rhythm, see the places where history meets with the modern city, museums areas and parks, go trough some of the traditional and commercial neighborhoods with cafes, book stores, and restaurants you can later visit for dinner. Learn about history, landscape and city environment. It is a four hour bike tour, starting at Cicloestacion Lomas. Sundays, the main avenue, Reforma, is closed to automobile traffic. So, peace and tranquility reign from 7am to 2pm every Sunday. I wish more cities did this. Wouldn’t Las Vegas Boulevard be great on a Sunday morning in May or October? Or the Mag Mile in Chicago, 5th Avenue in NYC, the Ginza in Tokyo, or Nevsky Prospekt in St. Petersburg? The city’s mayor has devoted himself to promoting bicycling, by implementing these road closings and by installing a network of short-term rental bikes called Eco-bici, modeled after many other cities that have found when you place bicycles in convenient locations, and make it easy to use them, well, people do, and they love it. I have used this system in Paris, Quito, Washington, DC, and Columbus, Ohio. 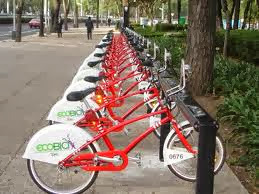 There are now about 100,000 users of Eco-Bici around the city. And a whopping 275 stations. No excuses!!! A one day card is only 90 pesos or about $5 USD. Three days 180 pesos, and a week, only 300 pesos. Pay so little! The route enters the nearby section of Chapultepec through Puerta de Leones, or “Lion’s Gate”, the name given to the entrance to the Botanic Garden on Paseo de la Reforma. A few meters further on, you’ll reach the Altar a la Patria, the largest and grandest of the three monuments built in memory of the “Boy Heroes”, a group of Mexican cadets who died at the Battle of Chapultepec during the Mexican-American war in 1847. Peddle a little further and stop at the Baños de Moctezuma (Baths of Moctezuma), a circular well that used to be c+O9onnected to the ancient springs at the foot of Chapultepec Hill, from where water flowed towards the city for over 400 years. Rumor has it that these baths were used for swimming by the Aztec emperor, Moctezuma, and by Maximilian, the short-lived Habsburg Emperor of Mexico. Opposite the Baños de Moctezuma, you’ll find a natural work of art called the Ahuehuete de Moctezuma (Cypress of Moctezuma). The story goes that this was planted at the emperor’s request by Nezahualcoyotl, ruler of the Chichimeca people from the city of Texcoco. This is the most symbolic tree in the forest with an approximate height of 40 meters, having lived for 500 years. Continue down the Gran Avenida and stop for a rest in front of the Totem Canadiense, an incredible wooden sculpture donated to Mexico by the Canadian people in 1960. Notice the intense color of this statue, which was sculpted by indigenous inhabitants of the north-east coast of Canada, as you stop to regain some of your energy. Finish off your tour with a jaunt around the Fuente de las Ranas (Frog Fountain), one of the oldest fountains in the forest which was built in Seville, Spain, by Miguel Alessio Robles, Mexico’s Minister Plenipotentiary in the country. More on Reforma: Paseo de la Reforma is the main avenue in Mexico. It is the widest street inspired by Champs Élysées in Paris, it was built in the second half of the XVIII century by the Emperor Maximiliano de Habsburgo. “Reforma” as Mexicans call it is the street that takes you to the Historical District. On Sunday mornings from 8am to 2pm the street is closed for vehicles. People love to either bike, run, or skate on the street, and enjoy some of the most emblematic monuments that are situated in Reforma such as the Angel of Independence and the Diana Cazadora. So far, eccobici bike sharing does not seem too popular. But then again, today, Sunday, the Paseo de la Reforma is closed to auto traffic until 4pm. Hallelujah, fellow cycle- paths!! So, after a big breakfast, I will walk over to Ciclovia for my 4 hour bike tour, plus lunch, and I hope, my first paleta. I would say that post-tour, that deserves some tapas and several cold beers. Mr. Mike will be here in the evening for his cameo. I would be shocked if Barry the V from Cape Town shows up! PS. I was the only one, so I had a private tour. I am certain the Ecuadorians scheduled to ride with me have bigger cajones to fry, after that terrible quake there. But I say this city surprises, as it is very bicycle friendly, even off of the main drag. And it is so green, with far more trees than most cities I have visited. And the street food is a match for Bangkok, or even Hanoi! And so reasonable. Alas, I am tired, with hardly any sleep, and 2, 000 feet of altitude, the short 15 miles or so was enough, even though it is about half of my cycling mileage back home. My guide, and tour owner, Antonio Suarez, was thoroughly delightful, a mild mannered city planner by day, and a guided bike ride small business on weekends. He helped design the bike lanes here, as well as the logistics for ecco-bicci. And his knowledge of Mexico City and its history is off the charts. So, I cry uncle, and headed down to the spa for a 70 minute massage. Buenos dias!